A fire outbreak weekend razed about 350 shops and stalls at a market in Funtua in Funtua Local Government of Katsina State, destroying goods and property worth N350 million. The mysterious fire, according to an eyewitness, started at about 7:41 p.m Friday and lasted for about two and a half hours, rendering thousands of traders jobless. The Chairman of Funtua Traders Association, Alhaji Sule Garba, who disclosed this while taking Governor Aminu Bello Masari round the scene of the inferno, said over 3,000 traders were transacting business at the market before the disaster. He told the governor that 350 shops and stalls were razed during the fire outbreak, despite efforts made by the officers of the state Fire Service to quench it. 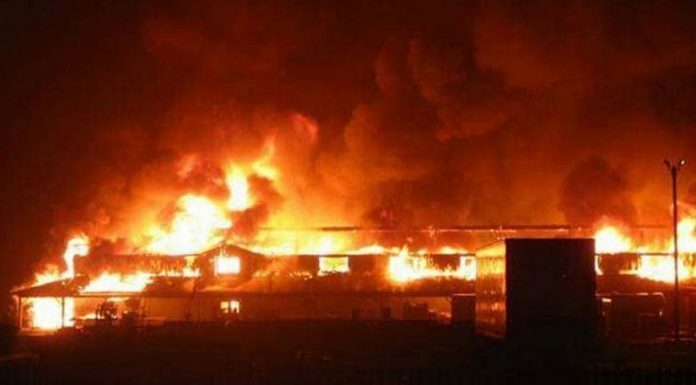 â€œ350 shops and stalls were completely razed down during the fire outbreak. However, men and officers of the state Fire Service worked hard to quench the fire but could not,â€ he explained. Garba while lamenting that goods worth N350 million were lost, however, called on the state and federal governments to come to the aid of the victims considering the devastating effect of the disaster. Responding, Governor Masari directed the state Environment Management Agency (SEMA) to commence the immediate assessment of the level of destruction caused by the inferno and report same to government for onward assistance of the victims. The governor urged the affected traders not to lose hope but continue to work and pray for the return of their means of livelihood.